Simone Garcia Johnson is the newly re-named Golden Globe Ambassador for the 75th Anniversary of the Golden Globe ® Awards. 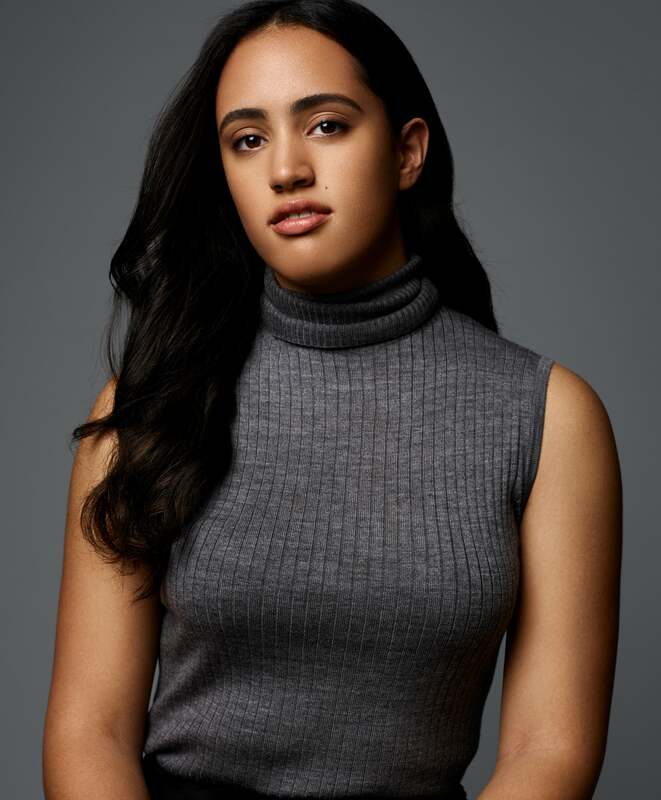 Newly signed to IMG Models, Simone Garcia Johnson is the daughter of entertainment icon Dwayne Johnson and producer and Chairwoman of Seven Bucks Productions Dany Garcia. The announcement was made at a star-studded party at Catch LA in West Hollywood, hosted by the HFPA and InStyle, and presented by FIJI Water and INFINITI. HFPA President Meher Tatna made the announcement revealing the honoree’s new title, formerly known as Miss/Mr. Golden Globe. 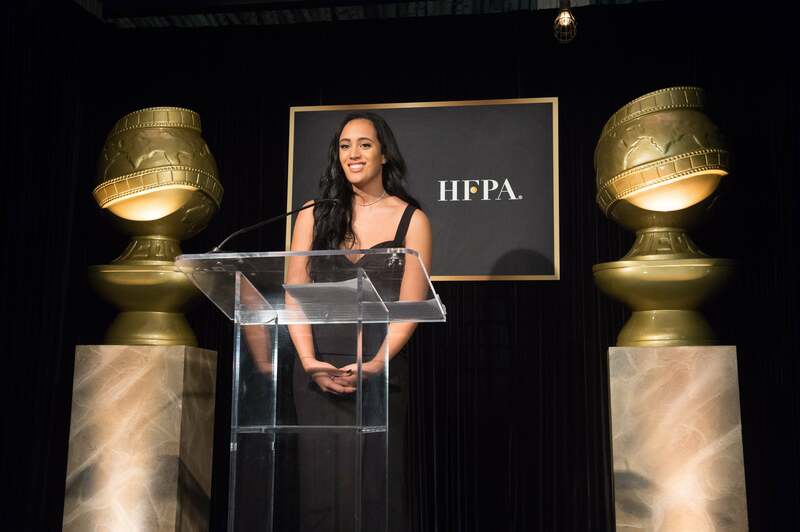 During the press conference, 2018 Golden Globe Ambassador Simone Garcia Johnson also announced her partnership with GlobalGirl Media as part of her newly minted title. Supported by the HFPA through their annual grant giving work, GlobalGirl Media empowers young women in journalism from disadvantaged areas by providing them the tools they need to become journalists and the opportunity to use their voice. Simone Garcia Johnson, our 2018 Golden Globe Ambassador, at the announcement press conference. Chosen by the HFPA, the honoree is traditionally the son or daughter of one of the industry's most respected actors/actresses/directors/producers of our time and assists during the Golden Globe Awards ceremony. The 75th Annual Golden Globe® Awards will air LIVE coast-to-coast on NBC Sunday, January 7, 2017, from 5-8PM PT/8-11PM ET from the Beverly Hilton Hotel. Previous honorees include: Sophia, Sistine and Scarlet Stallone, daughters of Sylvester Stallone; Corinne Foxx, daughter of Jamie Foxx; Greer Grammer, daughter of Kelsey Grammer; Sosie Bacon, daughter of Kevin Bacon and Kyra Sedgwick; Francesca Eastwood, daughter of Clint Eastwood and Frances Fisher; Sam Fox, son of Michael J. Fox and Tracy Pollan; Rainey Qualley, daughter of Andie MacDowell; Gia Mantegna, daughter of Joe Mantegna; Rumer Willis, daughter of Demi Moore and Bruce Willis; Laura Dern, daughter of Diane Ladd and Bruce Dern; Joely Fisher, daughter of Connie Stevens and Eddie Fisher; Melanie Griffith, daughter of Tippi Hedren; Freddie Prinze Jr., son of Freddie Prinze; and Mavis Spencer, daughter of Alfre Woodard and Roderick Spencer. WATCH the 2018 Golden Globe Ambassador Announcement.